"I wonder!" said he, leaning back and staring at the ceiling. "Perhaps there are points which have escaped your Machiavellian intellect. Let us consider the problem in the light of pure reason. This man's reference is to a book. That is our point of departure." "Well, well, it is surely not quite so bad as that. The cipher message begins with a large 534, does it not? We may take it as a working hypothesis that 534 is the particular page to which the cipher refers. So our book has already become a large book which is surely something gained. What other indications have we as to the nature of this large book? The next sign is C2. What do you make of that, Watson?" "Chapter the second, no doubt." "Brilliant, Watson. You are scintillating this morning. If it is not column, then I am very much deceived. So now, you see, we begin to visualize a large book printed in double columns which are each of a considerable length, since one of the words is numbered in the document as the two hundred and ninety-third. Have we reached the limits of what reason can supply?" "Surely you do yourself an injustice. One more coruscation, my dear Watson--yet another brainwave! Had the volume been an unusual one, he would have sent it to me. Instead of that, he had intended, before his plans were nipped, to send me the clue in this envelope. He says so in his note. This would seem to indicate that the book is one which he thought I would have no difficulty in finding for myself. He had it--and he imagined that I would have it, too. In short, Watson, it is a very common book." "Good, Watson, good! But not, if I may say so, quite good enough! Even if I accepted the compliment for myself I could hardly name any volume which would be less likely to lie at the elbow of one of Moriarty's associates. Besides, the editions of Holy Writ are so numerous that he could hardly suppose that two copies would have the same pagination. This is clearly a book which is standardized. He knows for certain that his page 534 will exactly agree with my page 534." "Excellent, Watson! I am very much mistaken if you have not touched the spot. An almanac! Let us consider the claims of Whitaker's Almanac. It is in common use. It has the requisite number of pages. It is in double column. Though reserved in its earlier vocabulary, it becomes, if I remember right, quite garrulous towards the end." He picked the volume from his desk. "Here is page 534, column two, a substantial block of print dealing, I perceive, with the trade and resources of British India. Jot down the words, Watson! Number thirteen is 'Mahratta.' Not, I fear, a very auspicious beginning. Number one hundred and twenty-seven is 'Government'; which at least makes sense, though somewhat irrelevant to ourselves and Professor Moriarty. Now let us try again. What does the Mahratta government do? Alas! the next word is 'pig's-bristles.' We are undone, my good Watson! It is finished!" " 'danger.' Ha! Ha! Capital! Put that down, Watson. 'There is danger--may--come--very--soon--one.' Then we have the name 'Douglas'--'rich--country--now-- at--Birlstone--House--Birlstone--confidence-- is--pressing.' There, Watson! What do you think of pure reason and its fruit? If the greengrocer had such a thing as a laurel wreath, I should send Billy round for it." "On the contrary, he has done quite remarkably well," said Holmes. "When you search a single column for words with which to express your meaning, you can hardly expect to get everything you want. You are bound to leave something to the intelligence of your correspondent. The purport is perfectly clear. Some deviltry is intended against one Douglas, whoever he may be, residing as stated, a rich country gentleman. He is sure--'confidence' was as near as he could get to 'confident'--that it is pressing. There is our result--and a very workmanlike little bit of analysis it was!" Holmes had the impersonal joy of the true artist in his better work, even as he mourned darkly when it fell below the high level to which he aspired. He was still chuckling over his success when Billy swung open the door and Inspector MacDonald of Scotland Yard was ushered into the room. Those were the early days at the end of the '80's, when Alec MacDonald was far from having attained the national fame which he has now achieved. He was a young but trusted member of the detective force, who had distinguished himself in several cases which had been entrusted to him. His tall, bony figure gave promise of exceptional physical strength, while his great cranium and deep-set, lustrous eyes spoke no less clearly of the keen intelligence which twinkled out from behind his bushy eyebrows. He was a silent, precise man with a dour nature and a hard Aberdonian accent. Twice already in his career had Holmes helped him to attain success, his own sole reward being the intellectual joy of the problem. For this reason the affection and respect of the Scotchman for his amateur colleague were profound, and he showed them by the frankness with which he consulted Holmes in every difficulty. Mediocrity knows nothing higher than itself; but talent instantly recognizes genius, and MacDonald had talent enough for his profession to enable him to perceive that there was no humiliation in seeking the assistance of one who already stood alone in Europe, both in his gifts and in his experience. Holmes was not prone to friendship, but he was tolerant of the big Scotchman, and smiled at the sight of him. "If you said 'hope' instead of 'fear,' it would be nearer the truth, I'm thinking, Mr. Holmes," the inspector answered, with a knowing grin. "Well, maybe a wee nip would keep out the raw morning chill. No, I won't smoke, I thank you. I'll have to be pushing on my way; for the early hours of a case are the precious ones, as no man knows better than your own self. But--but--"
"It is a cipher that Dr. Watson and I have had occasion to solve. But why--what's amiss with the names?" The inspector looked from one to the other of us in dazed astonishment. "Just this," said he, "that Mr. Douglas of Birlstone Manor House was horribly murdered last night!" 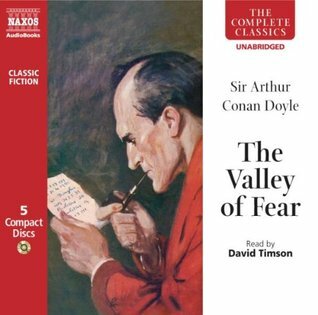 A classic Holmes story, also featuring the diabolical mastermind Professor Moriarty.